There has been different discussions here (with @MiggsEye @mlucas) on how to write a novel with Dramatica. Thanks to all in this Forum, Dramatica and to @jhull and his endless support I could finally finish (yup!) some First Drafts (yupyup! Plural) and turn some of my ideas into a novel. As I have learned again amazing things this year what you can do with the Software I would like to share my way to write a Novel with Dramatica. Hope I can help with this post other authors to write a Novel with Dramatica as well. First thing I do when an idea pops-up I write a short paragraph what’s my Story about. The paragraph looks like a simple logline or a short synopsis. This paragraph helps me later to navigate through the development process and keep me focused. I usually develop the plot before I develop further any characters. Depending on the approach you might choose Character Development could be added here as well. When the idea is somehow clear I brainstorm my Scenes. Doesn’t matter at this stage in which order or for which Throughline. I just jot down as many Scenes I can come up with and give them a short description. For a start a sentence, a word group or only a word is sufficient. When I have a list of Scenes together (16 minimum, 40-50 good average, 80-100 well done) I put them in a 4 act structure and check if I have an Inciting Event, Midpoint, Climax and an End. This is just a quick and dirty and prep work for my plot outline later. To get a better picture of my Story I use a one-pager-template. The one-pager on the picture is in German. The back I use to draw the act for each Throughline and to scribble my first ideas which Scenes goes where. - What is.. Inciting Event, Inequity, Driver, Goal, Climax? - Who is.. Protagonist, Antagonist and what are driving forces? - What is.. deepest fear, childhood wound of the Main Character which creates problems? - How does the Main Character trying to solve his problem and how this is challenged by the Influence Character? When the one-pager is complete I have a pretty good idea what’s going on in my story. This is the moment to do the Storyform in Dramatica. For the Storyform I check the One-Pager for corresponding Dramatica terms (concerns, issues or elements) to make my selections. I don’t stop before I have a unique form. If I don’t cant figure out the right form I rework my one-pager or do it again. To structure my acts I use a simple Word Document. Over the last years I have tried different tools and formats (Scrivener, Excel, Markdown) to structure the acts with Signposts. The plot progression tool in Dramatica is not really flexible and cumbersome when it comes to change the content. Word is the much better as you can change format and content quickly. Now comes the fun part: Putting it all together before writing the first draft. 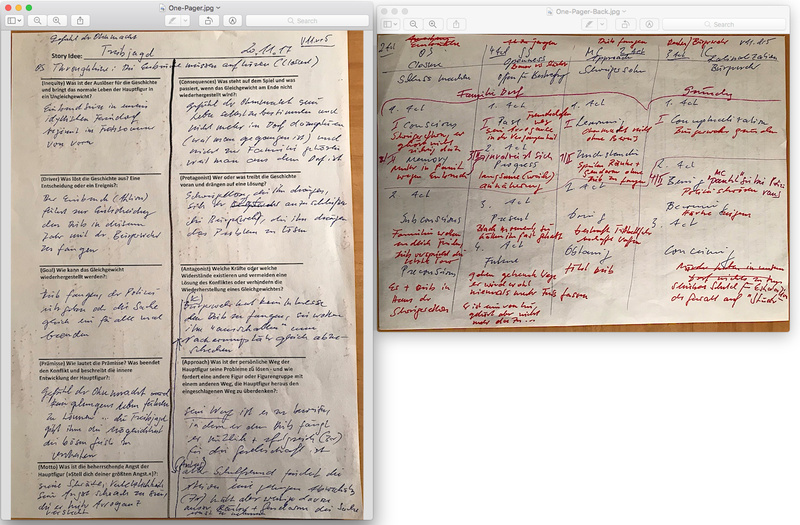 On each page (equal acts) in my document for each Throughline I add the corresponding signposts and a short synopsis as well. If the Throughline only has 2 or 3 acts I combine 2 signposts in 1 synopsis. If all signposts are assigned I check the Throughline makes sense and start adding Scenes from my Scene Outline. -	What does the Concern of the Signpost … has to do with the Scene? -	What does the Issue of the Concern ... has to do with the Scene? -	Why is that Scene in the Activity or the Universe Domain? -	How does the Concern of … is a problem within the Scene? -	How is the OS Problem, Issue .. reflected in that Scene and what does it have to do with the Signpost? -	Can I come up with any other Scene for this Signpost in that Throughline? When a Signpost, a Throughline and/or a Scene doesn’t make any sense I consult the Dramatica dictionary. The table structure with the repeating headers keeps me focused on the individual Throughline and helps me to stay in-line with my story. At the end of this exercise I should have all Scenes assigned and aligned with the respective Signposts. 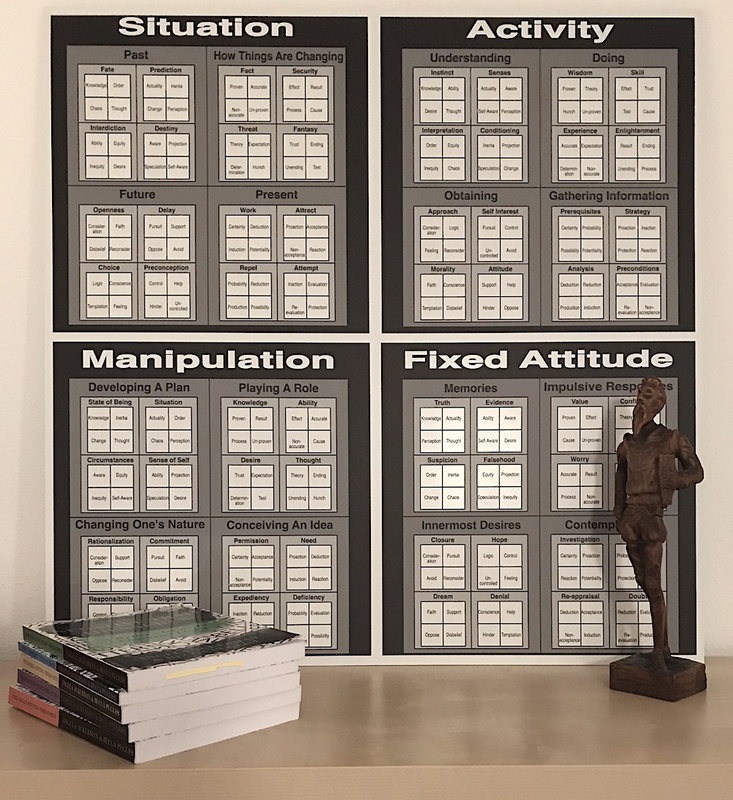 To tweak and polish my plot outline I might print out the Story Engine and the Plot Sequence Report (PSR) and go through each Signposts again. Often with the PSR I get some more Scene ideas. I use Scrivener to write my novels. Before I start writing I create as many empty text files in Scrivener as I have Scenes and copy-paste my Scene Outlines into the files. In order to keep focus on the Throughline during the First Draft I create 4 labels in Scrivener, one label for each Throughline. While I am writing my First Draft I avoid to follow the reflex to change anything in Dramatica. From my experience the Storyform will change after the First Draft anyhow. The entire process from the first idea to the First Draft can take weeks, month or even years. The idea and the Scene Outline I usually do in one go. Plot Outline comes much later. Convincing myself to start writing the First Draft often is the biggest challenge as obviously the fear it will never be perfect is nagging me. Gernot, thank you for doing this. I've been looking for a Dramatica Novel workflow. Merry Christmas! @Gernot: just stumbled across your thread and saw that you're writing in German. Have you gone through the effort of translating the Dramatica terms/definitions? Does a translation exist somewhere already? I'm writing in German as well and would love to reduce the time it takes me to figure out how to express the concepts in the Dramatica chart! 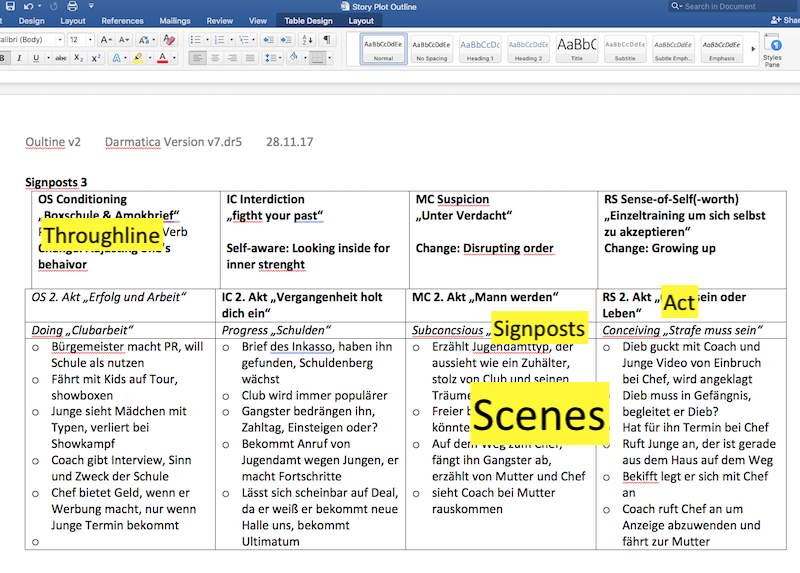 I have tried it several times and working now on Plotland - a Dramatica Thesaurus in German to support authors to develop character, theme and plot. Plotland is still in progress – but any feedback is much appreciated. The target audience for Plotland are authors who are looking for some useful examples for story development. There are tons of useful websites in English but only a handful in German and none for Dramatica. Each post on Plotland describes one of the Domains, Concerns, Issues or Elements. I have started and half way through with Issues and still have another 100+ items on the list to do. A post illustrates a term using word groups and short scene outlines to show how it can be problematic. At the end of each post there is a short 100- word-short-story and a link to explain what is what in Dramatica. When I started with Dramatica myself I used a dictionary to translate to most obscure terms, but struggled often big times. Sometimes just a translation doesn’t help anything further: How do you explain a German Interdiction, Prerequisites, Conceiving or Preconscious? What is the different in German between Fate and Destiny? What is a proper translation for Prerequisites or Reappraisal considering Dramatica Theory? So I started with Plotland and I am surprised every day what did I (not) understand in the past. 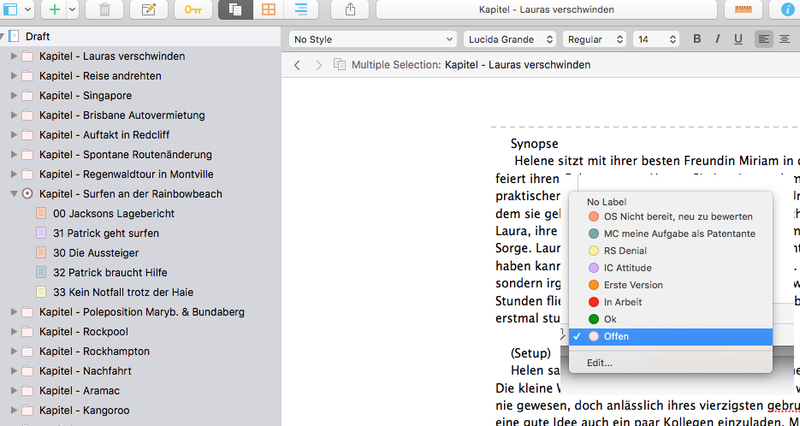 With Plotland I want to promote Dramatica among German writers as a fantastic tool to develop any kind of story. I also would like to share my experience how Dramatica helped me to finally finish some projects I struggled with so many years. That's awesome! Yes, I've been struggling with those same aspects and lose a lot of time just going back and forth between dictionaries and definitions, which can get really frustrating when you're trying to encode something and you aren't sure if your illustration is fitting or not. I was surprised that Dramatica basically doesn't exist in German but Plotland is a great idea! I'll definitely be visiting a lot! Thank you so much for sharing your blog. It's great! Great work. Thanks for doing this. It’s such a damned relief to find a forum where people are smarter than I am, so I can use their better ideas. That’s a recipe for learning and success. Can you, if it's not too much to ask, translate the writing in the protagonist box.